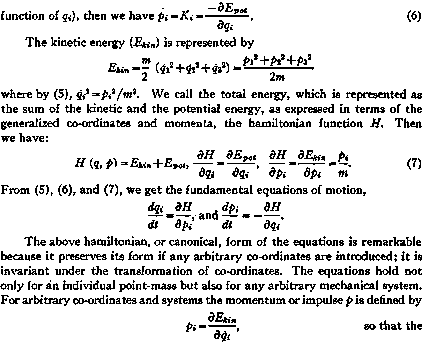 kinetic energy is expressed as a function of the g.'j and their derivatives the g.'s. To help visualization we can construct and consider the p and q as rectangular co-ordinates in two dimensions in the phase plane of our system. In this plane the sequence of those graph-points that correspond to the successive states of motion of the system represent the phase paths or phase-orbits. The characteristic structural feature of the quantum theory is that it selects a discrete family of phase-orbits from the infinity of possible orbits.